THE FIGHTING LIEUTENANT (June 20).—Don Arguello, in order to get the fortune of his ward, Princess Irma, insists that she marry him. The high-spirited girl repulses him as equally unworthy of love or respect, hut temporizes with him. About this time Captain Falconbridge, of the U. S. Cavalry, who is stationed at the Mexican border, is introduced to Irma at Don Arguello’s home by Don Carlos, a high-grade young Mexican, who consorts with Americans. At a later visit Don Arguello happens on the scene and shows his immediate disapproval by insulting the American flag which Falconbridge has presented to Irma. This so incenses the soldier that he requests the ladies to leave the room while he gives the old roue a sound trouncing. He has completed this in satisfactory fashion, the furniture being wrecked In the struggle, when a detachment of Mexican soldiers arrive. Falconbridge escapes the vengeance of the reinforcements by leaping through a window. Irma, who is waiting the outcome of the fight in the garden, decides to fly over the border with the American and escape her vengeful and despised guardian. Don Carlos admires Irma, but unselfishly gives aid in this good cause. Close to the border the fleeing pair is forced to take refuge in an adobe. There they “stand-off” the pursuing greasers until the boys of Falconbridge’s command, hearing the firing, and scenting trouble, ride over the border and make a daring rescue. Margaret Herrik Library, William Selig Papers. 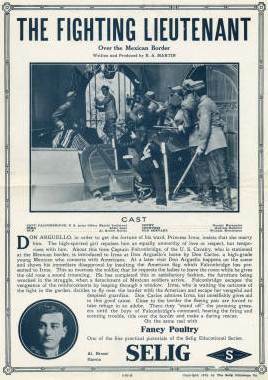 Si un mexicano raptaba a una norteamericana, quedaba exhibido como un lujurioso inmundo y era castigado por ello; en cambio, el protagonista norteamericano de The Fighting Lieutenant (1913), que raptaba a una mexicana para salvarla de un matrimonio sin amor y llevársela a los Estados Unidos, quedaba como un héroe. Written and directed by the rather anonymous E.A. 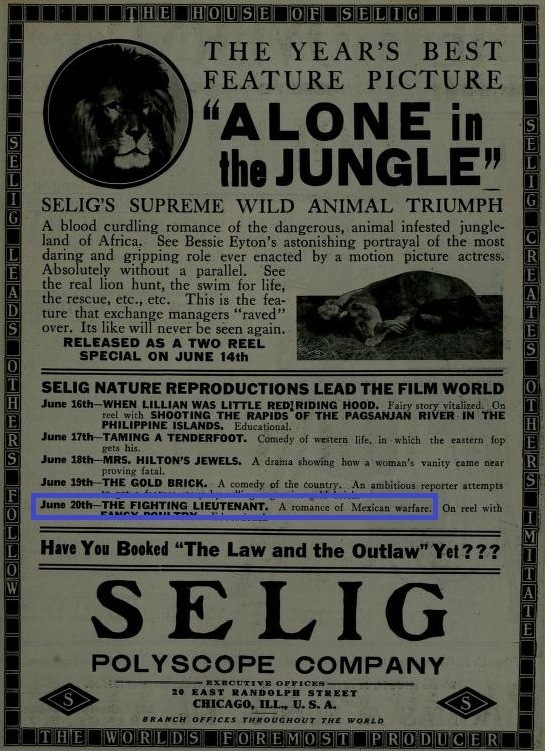 Martin, this silent Selig Polyscope presentation starred Harold Lockwood as a U.S. cavalry officer, stationed on the border to Mexico, who saves a lovely senorita (Adele Lane) from a loveless marriage to a scoundrel (Al E. Garcia). A former stock player with the Philadelphia-based Lubin company, brunette Adele Lane later appeared for various Universal companies. Her screen career, alas, didn’t outlast the 1910s. Ficha filmográfica de The Fighting Lieutenant. Producción: Selig Polyscope Company. Director: E. A. Martin. Guión: E. A. Martin. Intérpretes: Harold Lockwood (Cap. Falconbridge); Adele Lane (Irma); Al Ernest García (Don Arguello); George Hernández (Conde); Eugenie Besserer (Condesa) y William Hutchinson (Viejo sirviente). Estrenada el 20 de junio de 1913.